Contrary to what you might believe, looking absolutely stylish doesn't require that much effort. Just make a silver shift dress your outfit choice and you'll look absolutely stylish. For something more on the daring side to finish off this look, throw in a pair of HOKA ONE ONE blue athletic shoes. 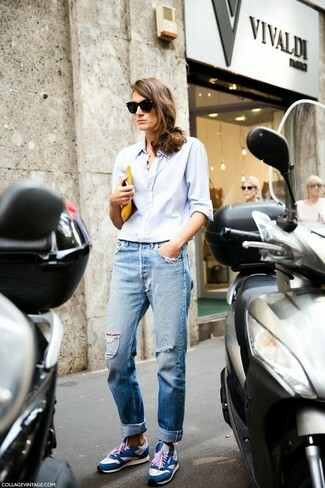 If you're hunting for a casual yet totaly chic look, marry a light blue dress shirt with light blue ripped boyfriend jeans. As well as super comfortable, both garments look great when worn together. 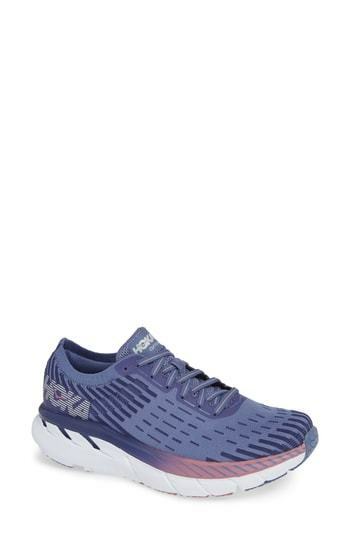 HOKA ONE ONE blue athletic shoes will add some edge to an otherwise classic ensemble. If you're in search of a casual yet seriously chic outfit, try pairing a black knit open cardigan with grey skinny jeans. These garments are totally comfy and look fabulous together. Blue athletic shoes will add a more relaxed feel to your outfit. For a knockout-meets-stylish look, choose a black fur coat and black leather skinny jeans — these two items play really well together. Make HOKA ONE ONE Clifton 5 Knit Running Shoe your footwear choice to make the look more current.